Wired & Wireless Microphone Master Class at Hard Rock Hotel in Las Vegas to be held the day before InfoComm 2018. On Tuesday, June 5, 2018, at Club Vinyl at The Hard Rock Hotel in Las Vegas, DPA Microphones and Lectrosonics will co-host a day of Wired and Wireless Microphone Master Classes. The Master Class is free to audio professionals for the benefit of learning and networking with their peers. These two manufacturers specialize in providing solutions for professional sound engineers to help them achieve the best results possible for a variety of applications including live sound, film, broadcast, and theater. 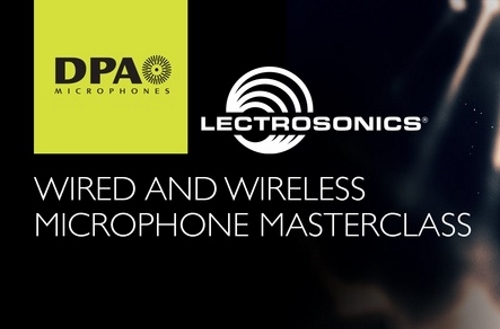 Hosted by Eric Stahlhammer of DPA Microphones and Kelly Fair of Lectrosonics, the Master Class on Wired and Wireless Microphones will be held from 9:30 AM to 4:30 PM PST, with presentations from each of these manufacturers. From 9:45 am to 12 pm, Kelly Fair from Lectrosonics will present his Master Class on FCC Re-Pack, Frequency Coordination, Antenna Usage and a brief product overview. Then, lunch will be provided. From 1:00 PM to 4:00 PM, Eric Stahlhammer from DPA will present a Master Class on Microphone Technology for High-Performance Venues. Club Vinyl is located inside The Hard Rock Hotel at 4455 Paradise Blvd., Las Vegas, NV 89169. To sign up for this free event, please register here.